Hey all! The many things that have kept me away from the site lately are now behind me and I have to say that I’ve really missed you guys! 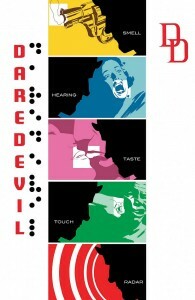 I hope all of you are well, and bet you’re as excited for Daredevil #9 as I am. So, what’s new in Daredevil land? Well, quite a bit actually. The Marvel solicitations for April are finally here and we’ll be seeing Daredevil not only in the previously talked about Omega Effect – which sees him appearing in Avenging Spider-Man #6, The Punisher #10 and Daredevil #11 – but in Daredevil #10.1 and Hulk #50 as well. Yep, that’s five appearances in one month, four of which will be major. As if that weren’t enough, we also have the Season One: Daredevil original graphic novel, by Antony Johnston and Wellinton Alves, to look forward to! I made a list for myself of “everything you would need to know about Daredevil if you’ve never read the series before” — everything from his name to his profession to Foggy’s name to the reasons why he does what he does to his every superpower and so on and so forth — and then I very carefully and very deliberately laced all that information into a story that shows DD in action and sets the stage for the next story arc. It’s a surprisingly difficult thing to do, actually — not to hit those informational beats, but to avoid boring longtime readers by revealing those details in new and different ways. I think we pulled it off. If not, I look forward to your emails. Well, that’s it for now! I’ll see you in the next couple of days. Also, I should note that I always make sure to update the Facebook page as soon as I see anything of interest which means it’s usually more up to date than this site when it comes to new links. If you’re on Facebook, you might want to hit that like button.